Good golly! That was an incredible shave! Two passes and I’m smooth as a baby’s bottom. 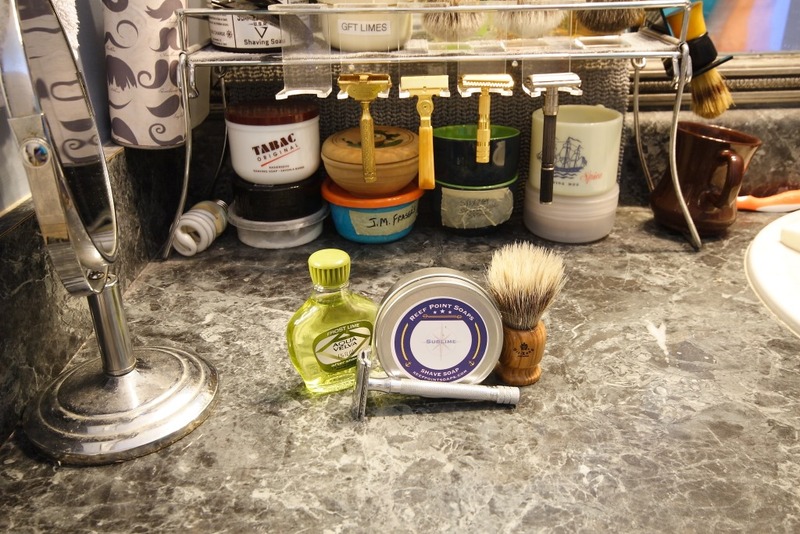 Gave the Tiki a break and opened the Sublime from Reef Point Soaps. It is a lime scented, slightly menthol based, tallow soap. At first you don’t feel the menthol as you lather it on, but then it hits and intensifies to a very pleasing level. After the shave I can still feel the tingling! The soap performs like a champ. My face seems to like it a bit on the watery side. I’m not 100% sure, but I think the blade today was a used Gillette yellow. I didn’t even bother to check! What a great soap! Decided to go with some vintage Aqua Velva Frost Lime. I smell very little lime. Maybe it is my nose. Honestly I thought I detected a bit of Lilac Vegetal to it. Isn’t that weird? It seems that the power of the menthol is reduced, perhaps from age (about 40 years old or so). But it did feel great on the face. No sting today so I know it was a good shave!